Porcelain. Avoid bleach, abrasive solutions/scrubbers, and harsh chemical cleaners, as these may slowly erode porcelain sink finishes (especially thin porcelain enamels over steel or cast iron). For stains, start gentle, soaking with just dishwashing liquid, then escalate slowly first to a paste of baking soda and water (don’t scrub), and then to a baking soda/ammonia combination or specialized porcelain cleaning solution. White vinegar can be used for removing calcium deposits. In general, avoid exposing porcelain to extreme temperature changes such as pouring boiling water into the sink (at least run cool water as you do) or setting pots and pans into the sink while still hot from cooking. Enamel cast iron. With their glossy smooth surfaces, these sinks are attractive, but highly susceptible to staining and other damage. Best bet for preserving, is to follow all the rules for porcelain, but to rinse and dry thoroughly after each use. Use extreme care also with heavy pots and pans, as the thin enamel is susceptible to chipping. Fireclay. Fireclay is a ceramic-porcelain finish for sinks that is generally more durable than straight porcelain/porcelain enamels and more resistant to rust and water stains. Porcelain rules still apply, though, when it comes to avoiding extreme temperatures and exercising care when washing heavy items that can chip or scratch the finish. For stains, start with a mild dishwashing liquid, then move up to either a mildly abrasive cleaner or a 50:50 water/bleach solution. Avoid abrasive pads, hard scrubbing, and ammonia. Stainless steel. While less expensive and easier to care for than porcelain, stainless steel is highly susceptible to scratching, which can dull a sink’s appearance over time. It’s generally safe to use a small amount of mildly abrasive, disinfecting cleaner with plenty of hot water and a soft rag (versus a scratchy pad) for routine cleaning. If using a cleaner containing bleach, be sure to rinse both immediately and thoroughly. Aluminum. 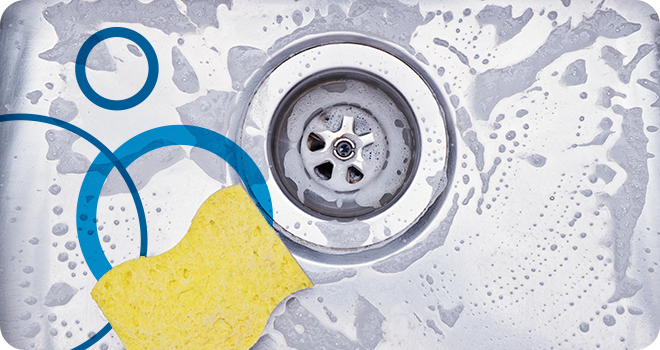 As with other sink types, cleaning regularly with a mild dish detergent is best. Bleach should be avoided as it can cause the aluminum to blacken over time. For stains, use borax (sodium tetraborate), which is an alkaline mineral salt of boric acid. Copper. Antimicrobial in nature, copper sinks are best cleaned with a pH neutral dish soap and a soft cloth, then wiped and dried with each use to prevent staining (especially in areas with hard/high-mineral content water). Copper is especially susceptible to damage from acids, which includes harsh cleaning solutions and acidic foods such as tomatoes and citrus fruits (always run plenty of water when working with and disposing of such foods in a copper sink). Also avoid using ammonia, lime, and rust removers; wax periodically to preserve a copper sink’s natural patina. Acrylic. Inexpensive, colorful, and relatively stain resistant (with regular cleaning), acrylic sinks are still susceptible to scratches, which will cause them to lose sheen over time. Avoid using heavy abrasives, abrasive pads, hard-bristle brushes, or hard scrubbing. To remove tough/hard-water stains, fill and soak the sink with a weak bleach solution, then rub stains with a soft cloth. Scratches may also be sanded lightly with a fine-grain sand paper, then filled with an acrylic cream polish. Granite. While generally sealed for protection, these delicate sinks need regular cleaning, wiping, and drying to look their best. Avoid all abrasives, acids, and alkaline solutions. Rinse and dry thoroughly. As with copper, do not allow acidic foods to sit for any length of time on the sink’s surface. Use a small amount of mineral oil on occasion to protect against water stains and re-seal regularly. Granite composite. Combining granite with pressed granite stone dust and acrylic, composites are less delicate than pure granite, but still susceptible to dullness and streaking. Avoid ammonia and all harsh abrasives. For stains, start gently with a 50:50 mix of white vinegar and water or a baking soda paste (soak, don’t scrub). For more intractable stains, a 50:50 solution of bleach and water can be used.